Part performance, part impersonation, part documentary but fully multi-media, BOOM (which is premiering at the High Performance Rodeo) tackles the era between 1945 and 1969, or what we in North America more affectionately call the baby boom era. There’s lots of dramatic fodder for Miller to mine as he draws on both Canadian and American history and major world events to paint a picture of what it was like to come of age during this pivotal time. It’s the time after all when radio gave way to TV and TV helped birth mass consumerism. A time when mellow gentleman crooners like Perry Como were overtaken by sexualized song men like Elvis and Jagger. A time when innovation took us from Hiroshima to landing on the moon. And of course an era when politicians like Kennedy, Castro and Trudeau were making waves at home and abroad. Miller makes sure we see and hear about it all. Set on a simply configured stage (designed by Yannik Larivee) consisting of a tall vertical cylindrical centre encircled by a horseshoe-like ring that comes to life in a visual splendor of multimedia magic, Miller leads us chronologically through the era playing (impersonating) the world’s most influential politicians, activists, actors and musicians. And I mean hundreds of them. Or so it seems. Miller gives voice to everyone from Churchill to Malcom X to Janis Joplin utilizing bitingly clever lighting, expressive animation and authentic archive footage to seal the effect. Miller sings, plays instruments, orates and unleashes impressions at such a dizzyingly talented pace that he is easily forgiven if one or two of the lot don’t quite land as strongly as the others. Conversely, squeals of joy erupt from the audience when Miller gets a particular nostalgic favorite just right as was the case with his ‘Rabbit of Seville’ bit. The audience also thrills at the litany of era-defining commercials Miller voices such as one showing Camel cigarettes being heartily endorsed by doctors as their preferred brand. 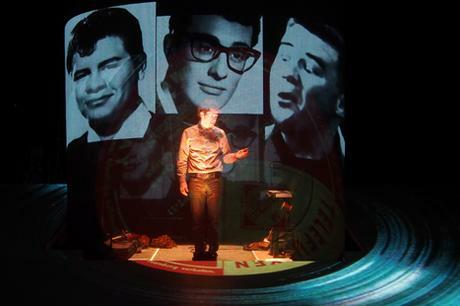 While there is no question that we are mesmerized by David’s Leclerc’s projections, Bruno Matte’s lighting and Miller’s seemingly endless ability to impersonate any individual, it’s the personal that elevates this show from being simply a visual and aural trip down memory lane. At the outset of the play, Miller gives voice to three baby boomers, Madeline, a small town Ontario woman who also happens to be his mother; Lawrence, a black American draft dodger/musician and Rudolph, an Austrian living in the American zone of Berlin. It’s through these characters and their feelings/ reactions to the events around them that really gives BOOM its heft. Granted, in the cacophony of information and images that abound in this show, it takes some time to latch on to these individual stories, but once hooked we are on the edge of our seats to see what happens to them next. Clocking in at two hours without intermission, BOOM is an exhaustingly busy but thrilling production that makes twenty-five years of history fly by in a manner that both tickles us intellectually and thoroughly entertains us. It was 1964 when Bob Dylan sang The Times They Are a-Changin’ and while his song of transformation wasn’t about how we experience theatre, it most certainly could pertain to Miller’s show. BOOM is not simply a superlative theatrical experience, but I’d venture to say that it will change the way we think of historical-docu period plays from now on.